Tactical Cell Phone Pouch | BUDK.com - Knives & Swords At The Lowest Prices! 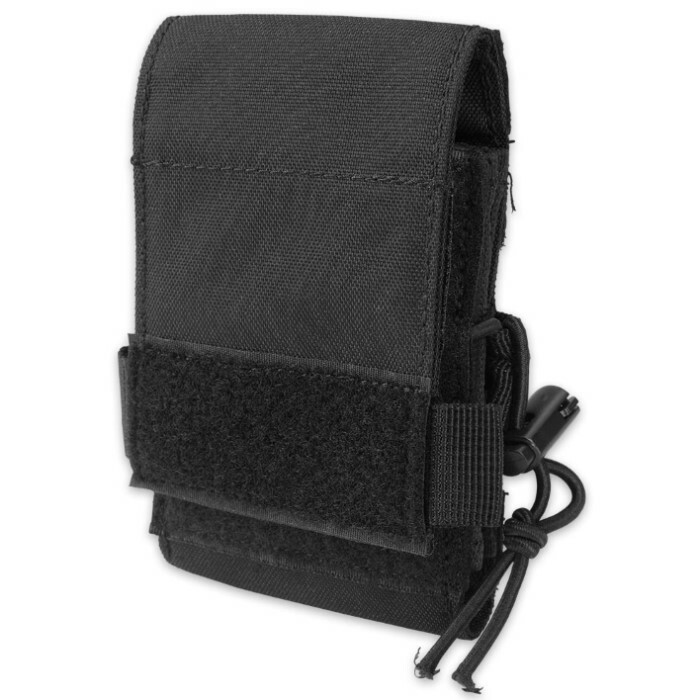 Dimensions: 5 1/4"x3 1/4"x1 1/4"
The Tactical Cell Phone Pouch is a modular pouch capable of holding most modern cell phones and small tactical accessories. The double-lined case features a stay open front flap that allows for video recording and two pull tabs lets you access your phone with ease. The hook strips on the backside of the modular web straps easily adhere to most standard duty belts. 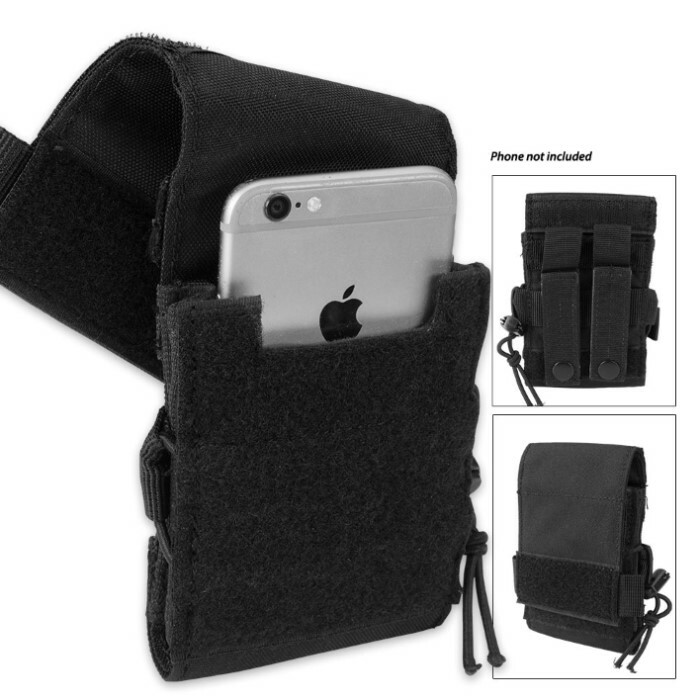 This is a must-have cell phone case to go with your tactical gear. Best cell phone pouch I have ever owned. I have an iPhone 8 and it’s almost impossible to find a decent case for my duty belt, all the cases from Amazon don’t fit and they are overpriced. I took a chance on this one because the price was so good and wow I was surprised! First of all it’s heavy duty, it’s made of a thicker material that will give your phone a layer of protection. The Velcro on the front closure is so strong you could probably go skydiving and not lose your phone, which brings me to my next point. It has MOLLE straps! I can strap it to my tactical backpack for hiking and feel confident it’s not going anywhere or falling out or even on a snowmobile or quad. I plan on ordering a few more, I am going to use one as a tactical trauma kit and another as a spare because there aren’t many out there that compare. This phone case is outstanding! Have been using cell phone cases with a clip for years, and they usually provided little in the way of protection and security. Not this case! 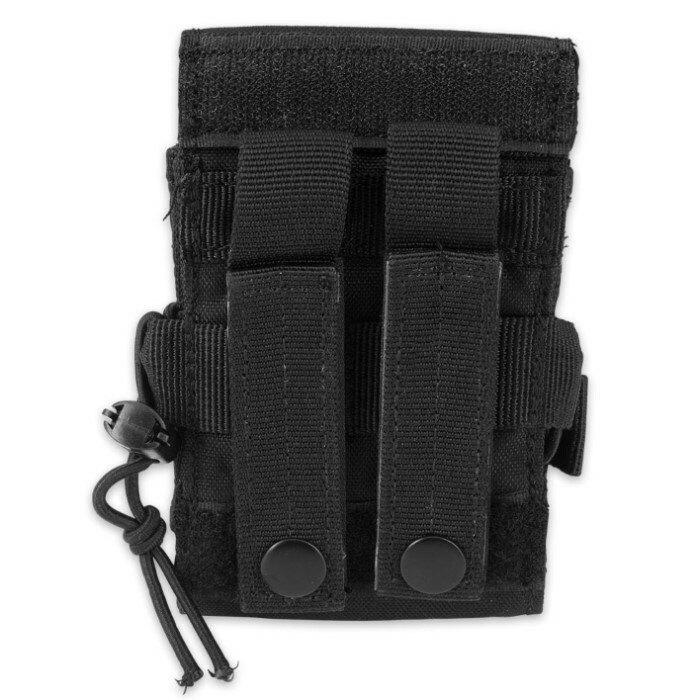 Has a MOLLE type attachment for the belt (actually better than MOLLE because it has velcro around the snap). Sturdy material to protect phone and accommodate a variety of phone sizes. Elastic cords at sides could fit attachment of tactical pen or whatever you might want to clip on. Excellent product. Now bring it out in OD green!